GSMArena team, 07 September 2013. The LG G2 comes with the standard set of accessories you'd expect in a smartphone's retail box. The A/C adapter that you need to use with the supplied microUSB cable are joined by a QuadBeat v2 headset. The headset is an in-ear design with flat cabling and a remote. The remote has an answer button, along with volume controls. There are two extra ear tip sets included. The LG G2 measures 138.5 x 70.9 x 8.9mm - nearly 2mm taller, a millimeter wider and thicker than the Samsung's current flagship - the Galaxy S4 - though the bigger screen accounts for most of that extra size. The G2 is 13g heavier than the 130g Galaxy S4, however, probably because of its bigger battery and shell. The LG G2 design language is pretty much the same as what we already saw in the company's phablet flagship, the LG Optimus G Pro. There are a few notable improvements though - the G2 has an incredibly thin screen bezel and lacks any hardware buttons below the screen. This way LG G2 is probably the smartphone with one of the highest screen-to-front-panel-surface ratios, its IPS display occupying almost the entire front. We already talked about the LG G2 footprint and how it's very close to the Samsung's top dog Galaxy S4. We've lined up the two beasts and took a few shots of them together for you to get a size comparison idea. LG G2 is built around a 5.2" True HD-IPS Plus display of 1080p resolution. According to the company, this is the largest a smartphone can get, while still being manageable with one hand. We did try to verify their words and we found there's some truth to them. It's not the most comfortable experience but the G2 can certainly be operated with one hand. The tap-to-unlock feature helps a great deal, too. The entire front is protected by Corning Gorilla Glass 3, while the non-removable battery cover is made entirely of glossy plastic, which is nicely textured with a small dot pattern. What's quite unfortunate though, is this is the same pattern as on the Samsung Galaxy S4 back or at least it looks an awful lot like it. Because of the glossy material, the G2 back is quite susceptible to fingerprints and smudges and you'll have to clean it regularly if you want to preserve the flagship's proper looks. Or you can just get the white flavor, where all those unpleasant fingerprints are not visible. We already met both the black and white versions of the G2 at its announcement party in New York in August. The fingerprint prominent surface aside, we still like the white flavor better. Besides the lively and huge IPS display, the G2 front panel accommodates the earpiece, the 2.1 MP secondary camera, capable of 1080p video capture and the proximity sensor. There's also a status LED that lights up in different colors depending on the notification - incoming or missed calls, alarms, calendar reminders, apps, etc. There are various settings for it. The right side of the LG G2 is completely bare, while the left one offers the lonely micro-SIM slot. The top of the LG G2 houses the secondary mic and the IR emitter for the remote control functionality. The bottom has the primary microphone, the loudspeaker, the 3.5mm audio jack and the MHL-enabled microUSB port. The G2's connectivity port supports TV-out, USB on-the-go and USB host. The front and rear panels are separated by a very thin silver frame. LG G2's back is where things get interesting. As you could expect, the OIS-packing 13MP camera and the LED flash are here, but all the new hardware controls are around here as well. The hardware one-piece volume rocker is just below the camera with a Power/Lock key dead center. When the screen is locked a long press on the Volume Up key launches the Quick Memo tool, while a long press on the Volume Down control fires up the camera. The Power/Lock combo at the volume rocker's center has a LED-lit rim that doubles as a notification LED. Unlike the front notification LED, this one lights up in white only on incoming notifications and when you wake up the screen or call someone. LG made a big deal out of the key's location. According to them, it provides for a more secure grip of the phone, it is more intuitive as it's exactly where the index finger usually rests and, finally, it's supposed to reduce the accidental drops, which are common when handling side buttons on big-screen smartphones. We are really glad to report it's exactly what LG claims to be. The key placement spares you lots of unnecessary finger stretching, the location of all three keys is really convenient but it takes a bit time getting used to it. Finally, it really provides better grip and lowers the chances of accidental phone drops. Someone should have definitely thought of this earlier! This is a great example of how a very simple concept can break the mold and come out as a great innovation. 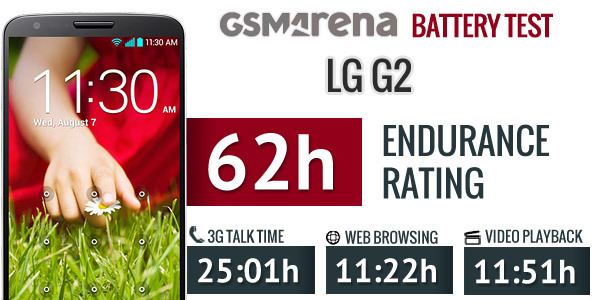 We ran our usual battery tests on the LG G2 and rated its endurance at the amazing 62 hours. The 3G talk time was pretty impressive - 25 hours, while the video playback and web browsing tests drained the batter after more than 11 hours. Normally with such numbers the endurance rating would have been higher, but a high power drain in standby reduced the final number. Still, the 62 hours endurance rating means your LG G2 will last two and a half days if you use the phone for 1 hours of 3G talks, 1 hour video playback and 1 hour web browsing each day. You can read more details about the G2 battery life over at our blog.